How gorgeous is this warm toned eye pallet from Wet n Wild? I was super happy this palette was part of Sharon's giveaway prize, where I won a fun selection of beauty goodies. Living in the UK we don't have Wet n wild readily available in the shops and this Comfort Zone palette suits my colourings more than the other WnW palettes. The 8 shimmery shades includes a soft yellow, a light pewter, a golden peach, light khaki green, a light coppery brown, a matt silvery black with gold shimmer, a dark brown and dark coppery brown with blue shimmer. The colours apply well and easy to build up more colour, my favourite shades are the pewter, peach and green. I don't usually wear shimmery eyeshadows but I think these will look great mixed in with my matte shades. I've always been a black eyeliner girl through and through, gel, liquid, Kohl pencil - it's always been jet black. 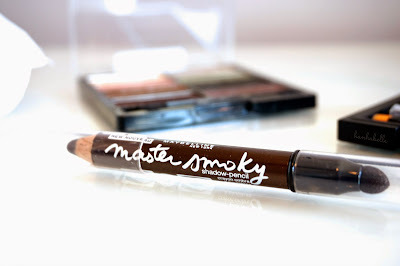 However I decided to step away from the raccoon look and picked up the Maybelline Eye Studio Master Smokey in Chocolate. It has a jumbo pencil on one end and a sponge smudger on the other end. The pencil glides on easily, no drag or pull and it doesn't matter if your line isn't perfect as the smudger is great to blend and smoke things out, without looking too heavy handed. The chocolate brown is very wearable, not too 'over done' and gives a nice flattering and easy eye look. It's also gentle enough for the waterline and easy to build up the intensity for a bolder look if you prefer. This eyebrow kit from Sleek looks very similar to the Benefit Brow Zing - I've never used the Benefit kit so I can't compare. This kit comes with a waxy formula and setting powder, with 2 mini brush applicators and mini tweezers - which aren't good for much in my opinion. There's 4 shades to choose from and I picked up Dark, the waxy formula is very pigmented and easy to build up colour but in some light the shade looks a little reddy brown on me. 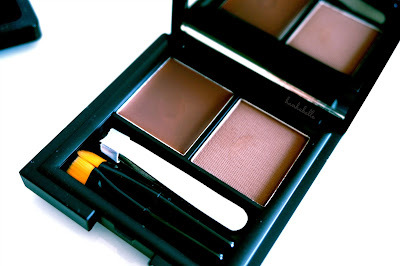 The setting powder is fine and easy to set your brows in place. This is a handy little kit that comes with a mirror too, perfect for on the go. What are your favourites products for smokey eyes? I think Wet 'n' Wild makes really nice eyeshadows. I am not particularly fond of the intense color payoffs, but that is just my general preference for eyeshadows whether it is drugstore or higher-end. I'd go for Wet 'n' Wild rather than MAC or Urban Decay. Wet n Wild is such an amazing buy at the drugstore! Crazy pigmented as well! But beware of the fallout though and don't drop your palette (like I did - HA!). 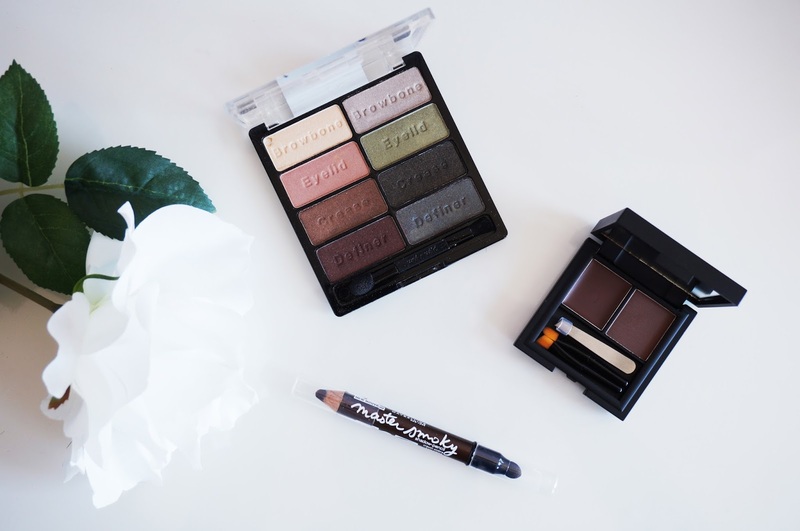 I've always been impressed with UD shadows as well as L'Oreal, but this Wet n Wild palette is good for colour selection. I've always wanted to try out WnW after seeing it used by US beauty youtubers! Oh no, I'm so clumsy that's what I did with my Naked 2 palette, the black shadow just dropped out clean and didn't smash luckily! This palette looks beautiful! I've heard so much and Wet n' Wild palettes, but I can never pick which one I want to try. Seeing swatches of this though really makes me want to play with it :) Would love to see you do a look using it! Thanks Marianna! I know they have a lot of palettes, luckily I think this one suits my skintone best. I did try and take some photos of me wearing this but the lighting was terrible - next time! Metallic bronze - good description! i JUST bought this palette lol. along with the other 2 wetnwild permanent 8 shadow palettes. it was on sale for $3.75 each! couldn't resist. haha I don't blame you, that's crazy cheap!